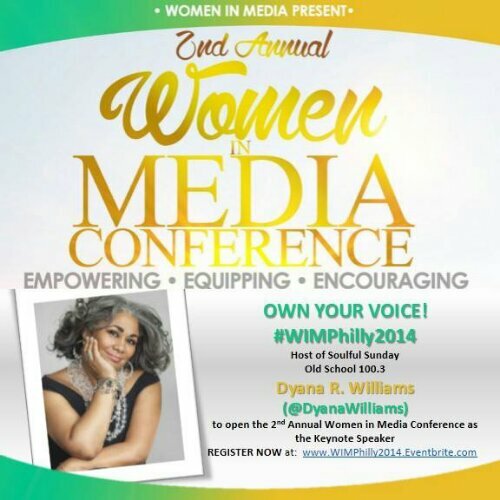 This past weekend, I had the pleasure of attending the 2nd Annual Women in Media Conference in Philly! For those who weren’t able to attend, you missed out on great opportunity to network and glean knowledge from media professionals. But never fear, there always will be other chances. It cost only $30 to register and in my opinion was an investment in my future that was worth every penny. It was a jam packed day so I tried to share as much information as I could. The day started off with a continental breakfast which allowed the attendees to network and socialize. 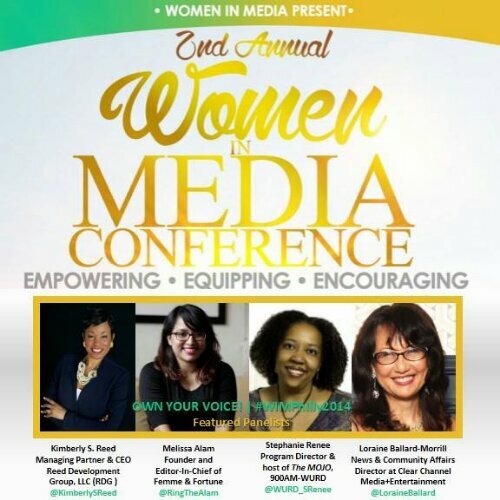 I met a number of great women who either work in or aspire to work in media. The theme for this conference was “Own your voice” which was very appropriate in our day and age. 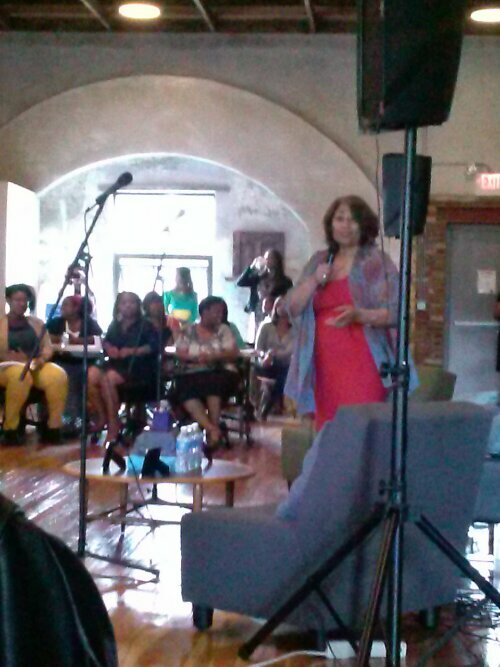 Keynote speaker and radio veteran Dyana Williams shared her pearls of wisdom. As women we tend to wear so many hats! Mother, friend, sister, employee! We can often get lost in the process of being EVERYTHING to EVERYONE! Owning our voice is so crucial, especially when the images we see as black women are so negative. We are seen as catty, unable to collaborate, unruly and disrespectful to our men. If you don’t believe me, you can turn on many of the reality shows for confirmation. We must set ourselves apart by owning our voice! Each of us had the choice of attending 2 of 3 workshops; Empowerment, Self Branding and Multimedia. First up, the Multimedia workshop. Ms. Binta Kabba lead this workshop. She is the Producer and Host of the Buzz Klub which can be seen on Public Access TV (Comcast 66/99 & Verizon 29/30) as well as YouTube. She shared great information about Philly CAM, a resource in the city that I never would have known about. Philly CAM provides programming that is not aired on the mainstream media as well as access production equipment, programs, classes and much more. In order to Build your Brand, you first have to Define it. Figure out your strengths, passions and goals and what sets you apart from your peers. Next build your contact list! Hold onto any business cards and save them into a spreadsheet. You never know when you’ll need someone. Also, utilize professional sites like LinkedIn and build those connects. For bloggers like myself, it’s a good idea to have a guest contributor on your site. It’s also crucial to have a great support system. Someone that understands your vision. Network! Even if you have to attend an event solo! Kate suggested this because if you go to an event say, with your bestie, you’ll most likely spend most of the time with them and not reaching out. Always look for opportunities to network! When there was none, she threw her own networking events! Join a committee that is related to your specialized field. Create a logo that represents your brand and purchase business cards! Lastly, the conference concluded with a panel of amazing media professionals including Lorraine Ballard-Morrill, Kimberly S. Reed, Stephanie Renee and Melissa Alam. The women each shared their trials and triumphs as women of color in a field that has been predominantly white male run. The highlight for many was a quote from one of the panelists, “Understanding your seasons of yes and understanding your seasons of no·” Everything isn’t for everyone. There will be times when you’ll have to say no an opportunity but it’s not the end of the world! 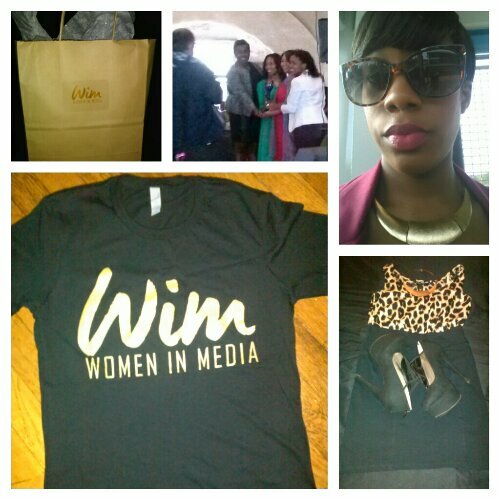 WIM gift bag, Dyanna Williams presented with an award, WIM t-shirt, Me! Yes girl, I went and had a great time! I meant to let you know but I wasn’t sure if I’d get the day off of work but anyway we can def meet up some time!